Policymakers have supported alternative fuels for many years and existing climate policies for transportation build on decades of energy policies designed to wean the country from oil. The success of those strategies has been a mixed bag. Auto efficiency has certainly improved, and given higher fuel prices, a revival of fuel economy standards and slower growth in travel demand, U.S. transportation energy use is forecast to decline slightly over the next 25 years. Nevertheless, the sector is projected remain over 95% reliant on liquid fuels; only natural gas is expected to make significant (though still small) inroads as a motor fuel. Because liquid fuels differ little in terms of how much carbon they contain per unit of energy they deliver, transportation sector CO2 emissions closely track fuel use. 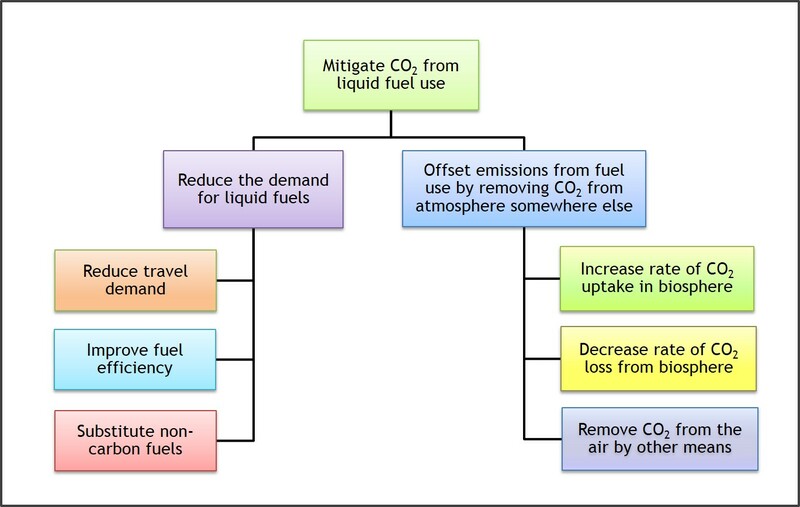 The diagram above classifies options for mitigating these emissions into two broad categories: reducing the amount of liquid fuel consumed and offsetting whatever CO2 is emitted when liquid fuels are used. The choices on the left side of the figure are well known: limiting the amount of travel, improving vehicle efficiency and shifting to non-carbon energy carriers such as electricity or hydrogen. All of these ways to reduce how much liquid fuel gets consumed are important. However, looking at the rates of progress and recognizing the technical barriers and costs of electric and hydrogen vehicles in particular, it becomes clear that strategies to reduce fuel demand are not enough to mitigate CO2 emissions as much as necessary to minimize climate risk. Unlike for power plants or other industrial sources of emissions, it is not practical to capture CO2 from tailpipes or jet exhausts. If a vehicle uses carbon-based liquid fuel of any form, the only other option is to counterbalance its emissions by removing, on a net basis, CO2 from the atmosphere in other locations. Broadly speaking, ways to accomplish this task are termed carbon dioxide removal (CDR) mechanisms and are listed on the right side of the figure. For CDR to be effective, the rate at which CO2 is removed from the air must be greater than the rate at which it is being removed under business-as-usual. CO2 is constantly absorbed and then largely re-emitted as part of the global carbon cycle. Just shifting the carbon from one use (say food) to another (say fuel) may not result in any additional net CO2 uptake. This brings us to biofuels. Many people believe that they are "carbon neutral," so that substituting biofuels for fossil fuels results in a CO2 reduction after adjusting for production-related emissions. However, biofuels do not appreciably reduce CO2 emissions when they are burned. Any potential benefit involves the removal of CO2 from the atmosphere when their feedstocks are grown. Biofuels therefore fall into the CDR category and their mitigation ability hinges on the extent to which feedstock growth results in additional net CO2 uptake, beyond what occurs as part of the existing carbon cycle. This analysis can be summed up as highlighting the need to think "beyond carbon neutral," that is, to find ways to remove CO2 from the atmosphere at rates faster than it is being emitted by fuel use. Because CDR is so critical for addressing CO2 emissions from liquid transportation fuels, mechanisms that go beyond carbon neutral are an essential complement to the more familiar measures oriented to reducing fuel demand. Further effort is needed to educate policymakers and the public about these insights into the "liquid carbon" part of the global climate challenge. "The liquid carbon challenge: evolving views on transportation fuels and climate,"